”One of the most energy efficient means of moving goods is by canal and the threats of global warming and oil depletion are resulting in a resurgence of interest in this means of transportation”: Professor Rex Harris. 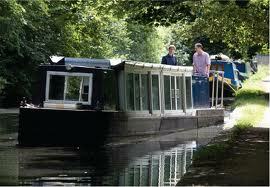 A zero-emission hydrogen hybrid canal boat has been developed by engineers at the University of Birmingham. The Ross Barlow shows how a combination of magnet and fuel cell technologies could be used to power inland waterways craft. It was named after Ross Barlow, a postgraduate student who worked on the hydrogen hybrid canal boat project in its early stages and was an enthusiastic supporter of sustainable energy. He was killed in a hang gliding accident in March 2005 at the age of 25. The diesel engine was removed from a standard maintenance boat, donated to the University by British Waterways, and replaced by a zero emission propulsion system and the central part of the boat has been converted into a covered demonstration area. Renewable electricity can be stored as hydrogen by splitting water by electrolysis. Hydrogen can subsequently be converted back to electricity and water by using a gas turbine or fuel cell. Green hydrogen is considered a clean fuel as it has a minimum impact on the environment and could reduce the levels of carbon dioxide and other greenhouse gas emissions. Use the technology on cross-channel ferries? Longer terms aims include the development of a canal side hydrogen refuelling infrastructure and to generate green hydrogen on suitable sites throughout the canal network. The boat will also be used as an educational tool. It features an LCD screen which displays information about sustainable technologies involving hydrogen and magnets and how these new technologies come together on the boat.